The story of Snake Bite! 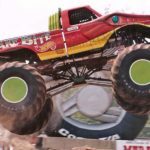 Welcome to the wonderful world of Snake Bite the monster truck! I am excited for this new chapter in what has been an everlasting phenomenon celebrating Snake Bite. 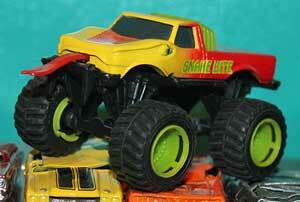 In 1990 a new toy line was being developed for the monster truck world. 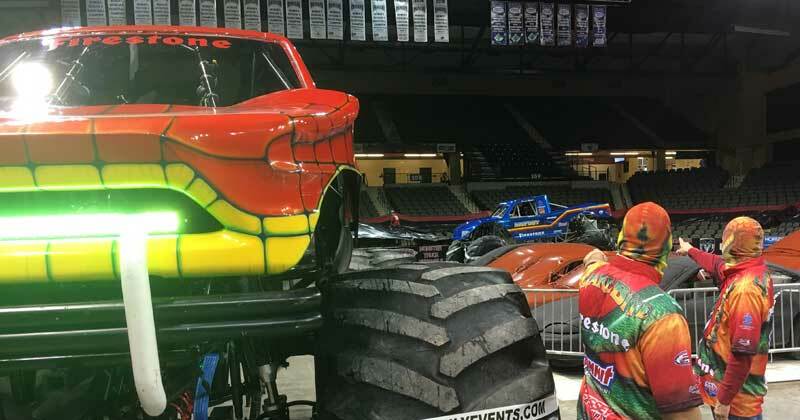 This line would include the king of the monster trucks, Bigfoot. However, as with any hero, there has to be a villain, and that is where I came in! Having worked hard under the Team Bigfoot banner, I was under the watchful eye all the time, with no room to just cut loose. The timing could not have been better. I was ready for a change. 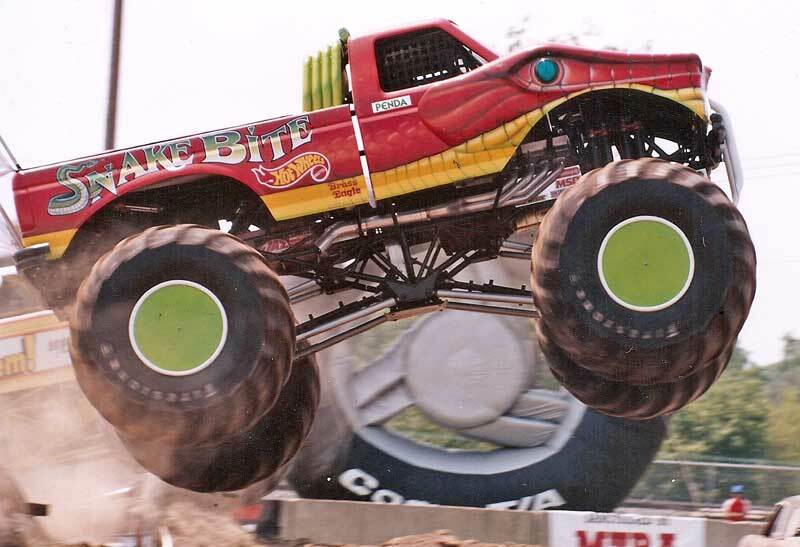 What I was about to do would turn out to be one of the most controversial monster trucks to ever be developed. 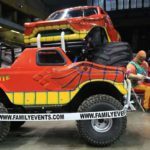 The first concept saw an evil, sinister-like serpent body with massive tires, long fangs and a forked tongue. It needed something that would elevate the machine to rock star status. 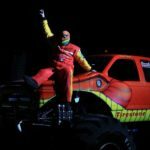 I was a driver willing to not play nice and do everything possible to take down Bigfoot, along with others, to be the best. I had just what it would take, being a self-righteous, energy-absorbing, full-of-himself character, to dethrone the almighty Bigfoot team. A new televised racing series was being developed that year and what a perfect opportunity it was to start that mission! On the way to the debut in 1991, I decided to call myself Colt Cobra from Cobra Creek, Colorado. PERFECT! 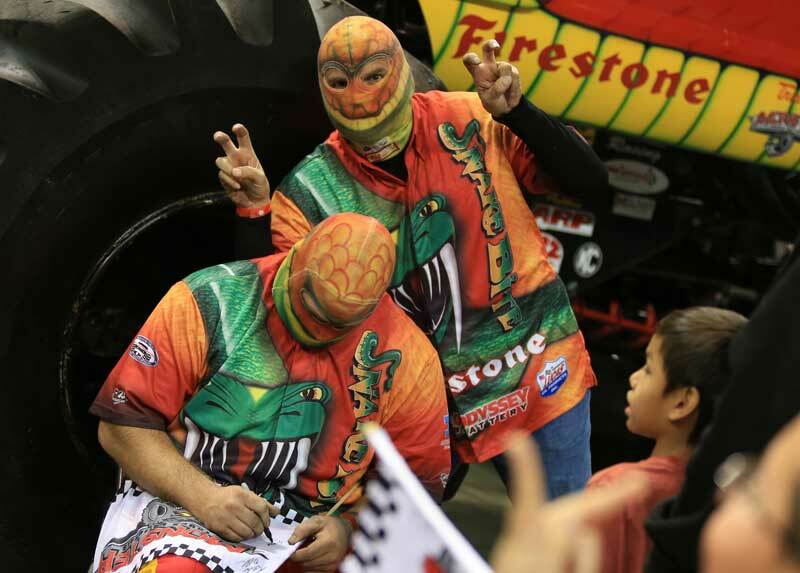 I adorned a mask in hopes of stirring up rumors and excitement for the thousands of people that would be in attendance. My scheme worked beyond my expectations. At the event, Colt Cobra was being photographed by all. History was being made. 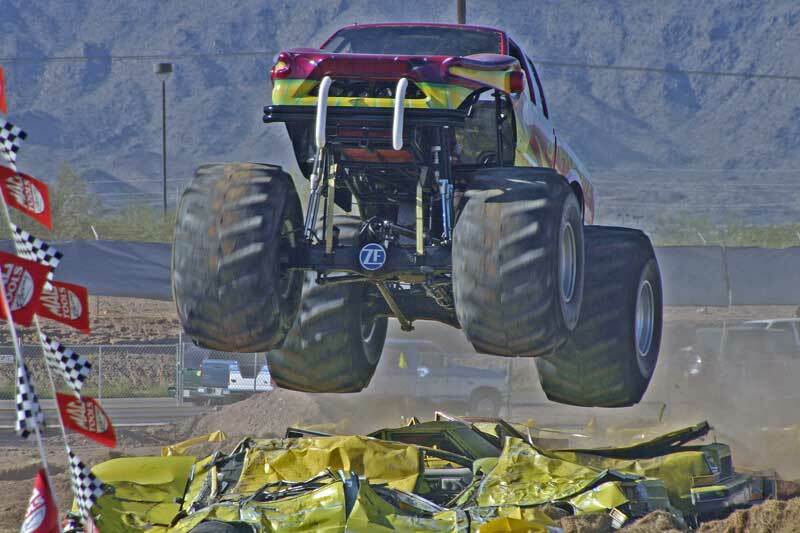 Behind the wheel, I had to prove that I belonged in the elite group of monster trucks, where I belonged. The start did not go as planned, with several less than stellar runs. However, one thing was certain, I was not to be denied victory lane, so matter the cost! In Union Grove, Wisconsin, I was running against trucks that were faster and lighter. I pushed Snake Bite to the limit and took out a small building, after jumping over a retaining wall. It was a highlight reel all on its own. With my lackadaisical attitude and erratic driving, Colt Cobra and Snake Bite was a combination to be afraid of. 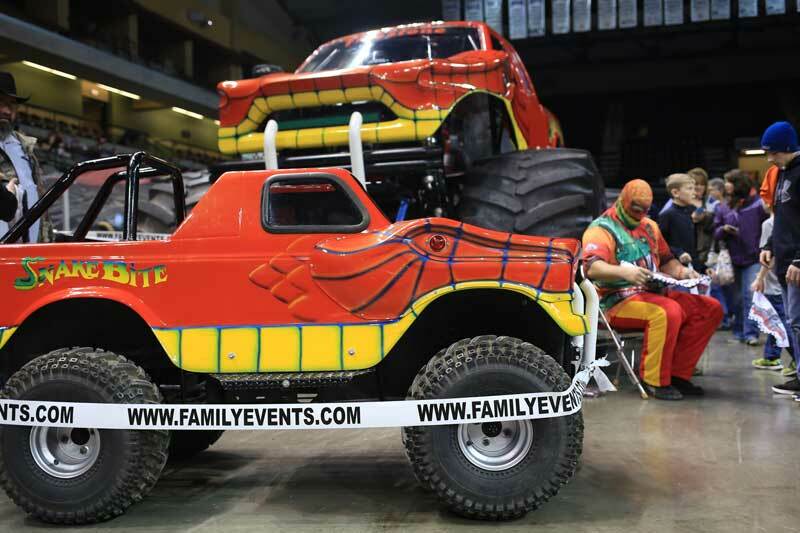 You could not pick up any off-road magazine without seeing me or the truck in full color. 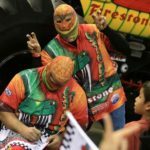 The competition grew tired of seeing Snake Bite, but our following was growing by leaps and bounds and was out of control! 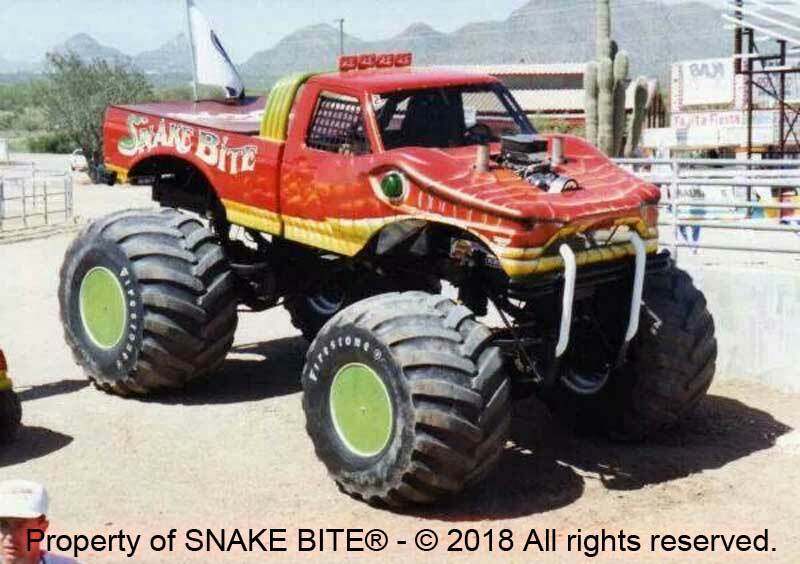 I was winning this war and soon came the demand for 2 and even 3 Snake Bite monster trucks. 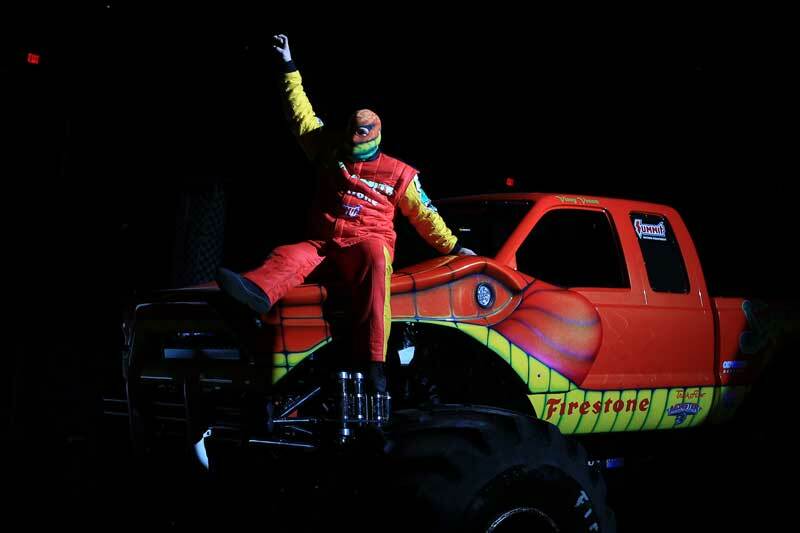 All the show promoters wanted a piece of this hot new truck and driver. Snake Bite had taken on the giants of the industry and proven that snakes do have a place in monster trucks. 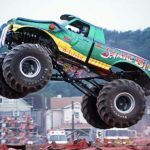 In 1991, I was even awarded a “Mover & Shaker In The 4×4 World” by one of the leading 4-wheel drive magazines. 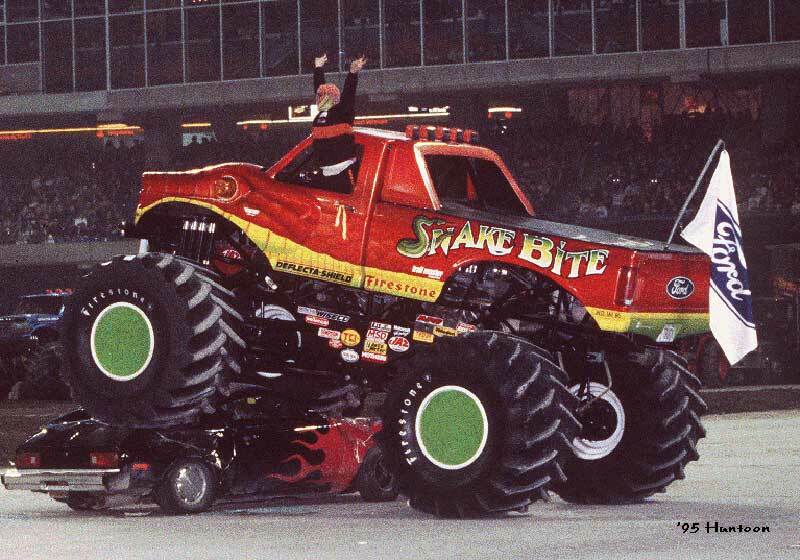 To this day, no other monster truck has ever duplicated this honor. 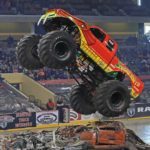 Colt Cobra and Snake Bite will be a winning combination that the monster truck world will never forget! 2016 was the 25th anniversary of Snake Bite, so we decided to bring back the retro red paint scheme and a brand new driver, Vinny Venom. 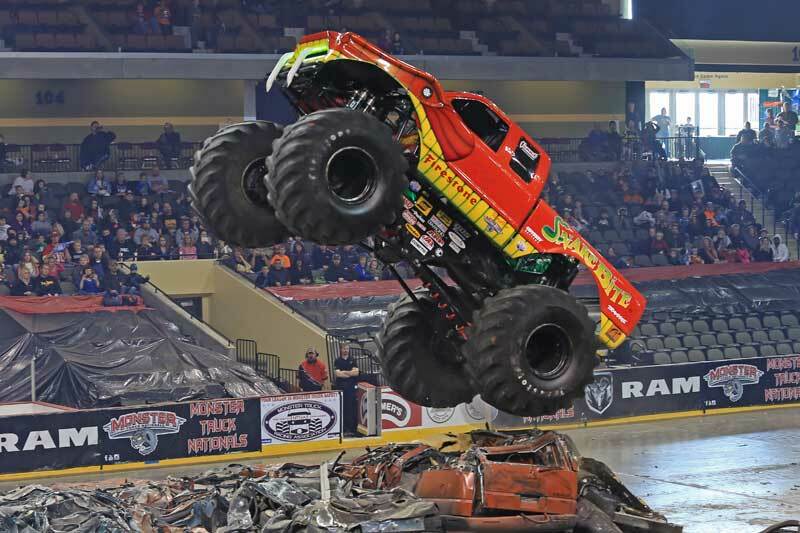 With me by his side, Vinny and Snake Bite went on to win multiple titles, including the prestigious “Toughest Monster Truck Tour” and the “4-Wheel Drive Jamboree” championships in 2017! Today, 27 years after I started this worldwide phenomenon, I would like to welcome my new driver, Kris Kopperhead. He will continue to carry on the Snake Bite name and look, so look out for him in 2018! While the body color has changed throughout the years, one true look has always been the wicked snake head, flashing eyes and white fangs dangling on the front, ready to strike. When others raced against Snake Bite, they too had to #FearTheFang! And to think, it all started with a wild drawing and a crazy driver, willing to go against all odds. 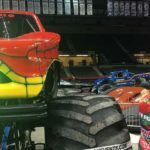 Memphis, TN – This was the debut of Snake Bite! I put on the mask for the very first time. I could feel the power running through my veins! 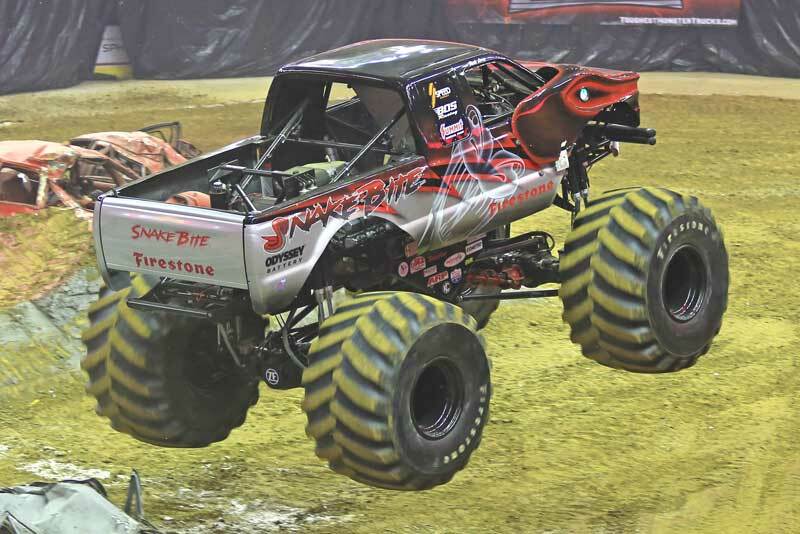 Pontiac, MI – This was at the world famous Pontiac Silverdome. 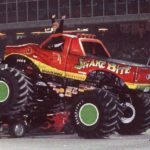 Joe Lowe was doing the announcing for the first of many grudge matches between Bigfoot and Snake Bite. For the title of King Of The Dome, it was a best of 3 matches. I had my hands full, and in the end, good triumphed over evil. Once again I was second. I slowly walked to the center of the track to offer my congratulations, only to be overcome with outrage and chose to take down Andy Brass with a full body slam! The crowd went insane. I knew who they had all come to see, and it wasn’t that FootJunk. 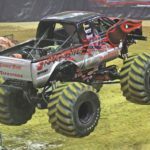 Houston, TX – Inside the Astrodome, the famed Grave Digger also wanted a piece of me. This was another best of 3 races. I beat him all 3 times! Boos rang out, but I was not worried. I showed no mercy, I was in charge. 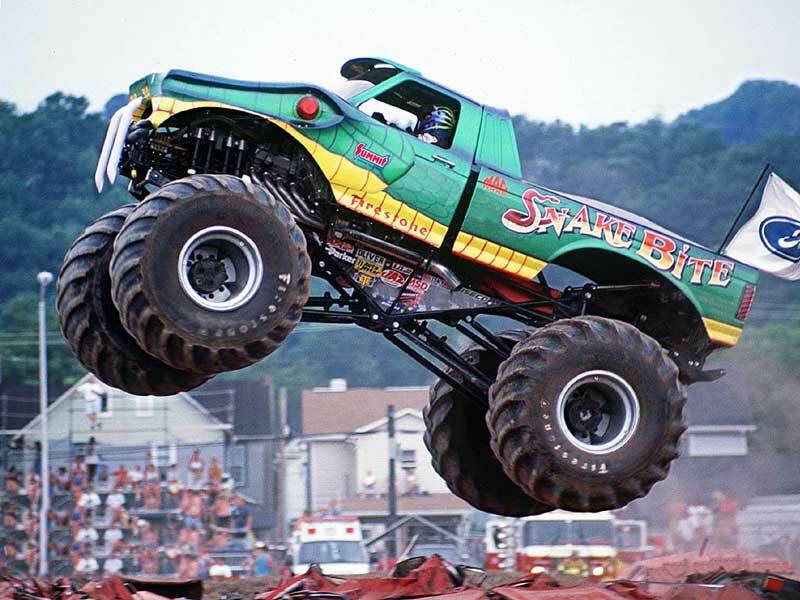 Watching Snake Bite return to its former glory by winning the 2016 4-Wheel Jamboree freestyle championship. 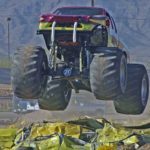 Watching Snake Bite win 3 championships in 2017: Toughest Monster Truck Tour, 4-Wheel Jamboree Freestyle and 4-Wheel Jamboree Racing.